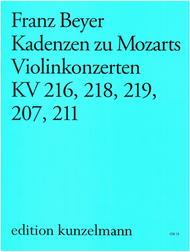 Cadenzas to Mozart Violin Concerti composed by Franck Michael Beyer. For Violin. Sheet Music. Published by Edition Kunzelmann (PE.GM0018).K. 207, 211, 216, 218, 219.